North Bend State Park, in West Virginia, is named for the horseshoe curve of the North Fork of the Hughes River. The park offers a multitude of recreational facilities in a beautiful pastoral setting. The fishing streams, lake, hiking trails, abundant wildlife and excellent overnight accommodations, lodge and cabins, andlodge dining roomare some of the features of this year-round park. You’ll find true hospitality at this popular state park. North Bend has a 305-acre recreational lake. A boat ramp, handicapped accessible fishing pier, and other fishing access points. North Bend Lodge sits atop a breeze blessed ridge that peers over the woodland river valley below. Decorated with solid oak furnishings, the lodge features 29 guest rooms. North Bend's nine deluxe vacation cabins are located atop a secluded ridge in a white pine forest. 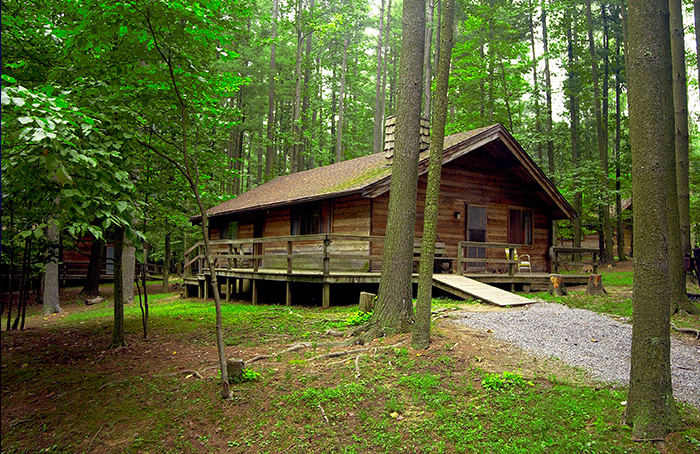 Constructed of solid cedar, the cabins offer fireplaces, central heat and air, telephone, and two, three, and four bedrooms. River Run Campground has a total of 49 camping sites, of which 26 sites have electric hookups. This campground is a family favorite. Each site has a picnic table and campfire ring. There are four ADA sites and a bathhouse. Cokeley Campground is a new place to play, fish, hike, bike, or sit by a campfire on a star filled night. There are 28 sites with water and electric hookups. Visitors dining in the glass-enclosed restaurant will delight to a sumptuous menu while enjoying the view of surrounding pristine rolling hills and wildlife. 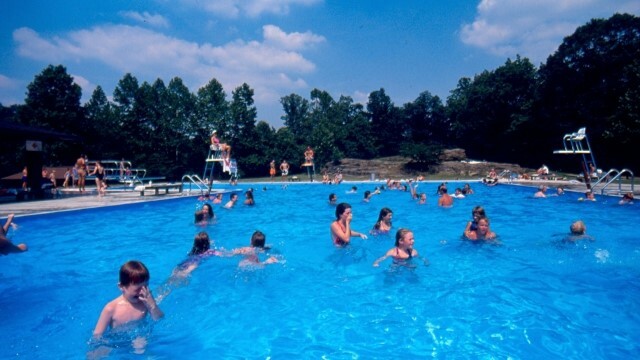 The outdoor swimming pool at North Bend State Park is located near the River Run Camping area. The pool is unique in that it sits atop a large hill with huge rocks, perfect for sunbathing. Hours of operation are typically Memorial Day through Labor Day Weekend. Hours are noon-6 pm. The pool is typically not open on Monday. The North Bend Rail Trail is a 72-mile multi-purpose recreational trail. The trail was designed for mountain biking, hiking, and horseback riding. Motorized vehicles are not permitted on the trail. The 305-acre lake at North Bend State Park is part of the North Fork of the Hughes River Watershed Project. The lake is 8.1 river miles perfect for boating and fishing. Boat rentals include canoe, kayak, Jon boats and pontoons. Bike rentals are available at the River Run Campground Check-in Station from Memorial Day through September. North Bend is excellent choice for bikers because of our easy access to the 72-mile North Bend Rail Trail with its nearly flat grade. In addition to the North Bend Rail Trail, North Bend State Park offers 14 hiking trails with a total of 20 miles. Trails are available for all skill levels including the “Extra Mile” trail, which is paved and level. A year-round nature and recreation program is available featuring programs on the park’s natural and cultural history. Programs run daily from Memorial Day through Labor Day. Special programs or tours can be arranged for groups. Take a Tour of the Lake with North Bend Outfitters!